Catherine is one of the first women game wardens in the U.S. Her first year is fraught with danger, pinching poachers and working with wardens who aren’t thrilled to partner with her. Cat uses her wit and good judgment when firepower and brawn are not available, winning the hearts of those who put her to the test. In 1976, Kim Camery Millick was hired as one of the first women ever to be a game warden. Working nights, holidays, and weekends as a conservation warden in the outdoors of central Wisconsin, she was introduced to elements of the harshest cold, the darkest nights, and the sweetest spring days. Every contact with the public could mean conflict. Armed and sometimes drunk citizens added more than an element of danger, especially when one was not armed oneself. 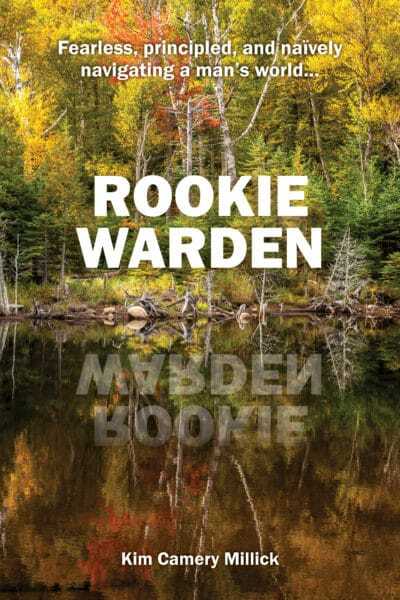 Events in the author’s career as a warden and later as a forester in the great North Woods of Maine come to life in this fictionalized novel, the rookie’s first year.